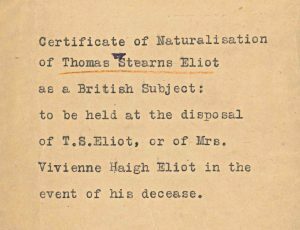 ‘I have applied for Naturalisation and been accepted, having pulled a few strings with the Home Secretary’ – T. S. Eliot in a letter to his brother, 25th October 1927. Eliot had started the naturalisation process several years earlier, with endorsements from Harry Crofton, a colleague at Lloyds Bank, and his friend, British diplomat and writer Sydney Waterlow. Busy with his day job at the bank and his evenings spent writing, Eliot didn’t return to his application until 1925; it took him a further two years to progress the application. The requirements for citizenship were similar to those in place nowadays: applicants had to have been living in the United Kingdom for at least five years, be of good character with adequate knowledge of the English language, and with the intention to ‘remain in His Majesty’s dominions or serve under the Crown’. Eliot’s residence had to be verified by a declaration from a natural-born British citizen, and general declarations verifying Eliot’s ‘memorial statements’ of application were required from four sponsors able to show ‘intimate acquaintance‘ with him. Finding (and keeping) these sponsors (who included Leonard Woolf) was no easy task. Sydney Waterlow who Eliot ‘particularly wanted’ on his application was disqualified on the grounds of being British Minister to Siam, Harry Crofton’s declaration had to be replaced when Eliot left the bank, and his father-in-law’s declaration was rendered invalid after his death. 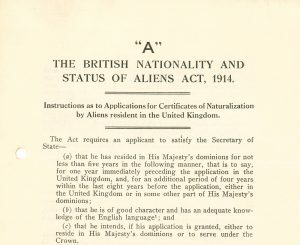 As instructed by the Secretary of State, Eliot put notices in The Morning Post and The Westminster & Pimlico News in May 1927, with a statement about his intention to become a naturalised British citizen. On the 20th October the Home Office informed him that a certificate of naturalisation would be granted to him on receipt of the usual fee. 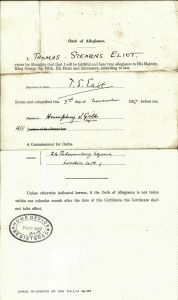 Eliot was granted a certificate of naturalisation on the 2nd November and signed the Oath of Allegiance the following day. Among Eliot’s naturalisation papers is the bottom half of a letter from Harold Macmillan, then Conservative MP for Stockton-on-Tees, to Charles Whibley – a friend of Eliot who had recommended him to Geoffrey Faber two years previously.